There are many books on tapping your creativity including Danny Gregory's books of which I have "The Creative Licence" his most recent foray into inspiring aspiring artists and which is availble from his website. Danny also has a very inspirational blog called Every Day Matters which you will find on his website. Marion Barnett gave me my copy of the book, and it was good reading for the aeroplane. 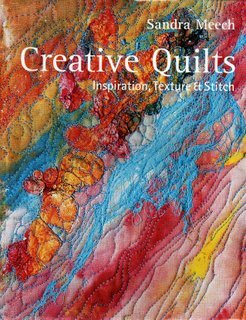 However I recently received Sandra Meech's new book Creative Quilts; Inspiration, Textures & Stitch published by Batsford and there is plenty of things to mull over and be inspired by. 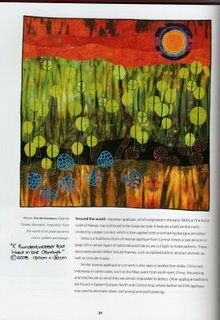 Sandra says of her book on her website ( which I have linked)"My new book is devoted to exploring creativity from the first ideas to the finished piece taking inspiration from contemporary art, architecture and world textiles and includes new techniques for texture using tyvek and wireform. Throughout the book there will be a closer look at design and composition, and with additional workshops and a whole chapter devoted to sketchbooks....there is something for everyone. " 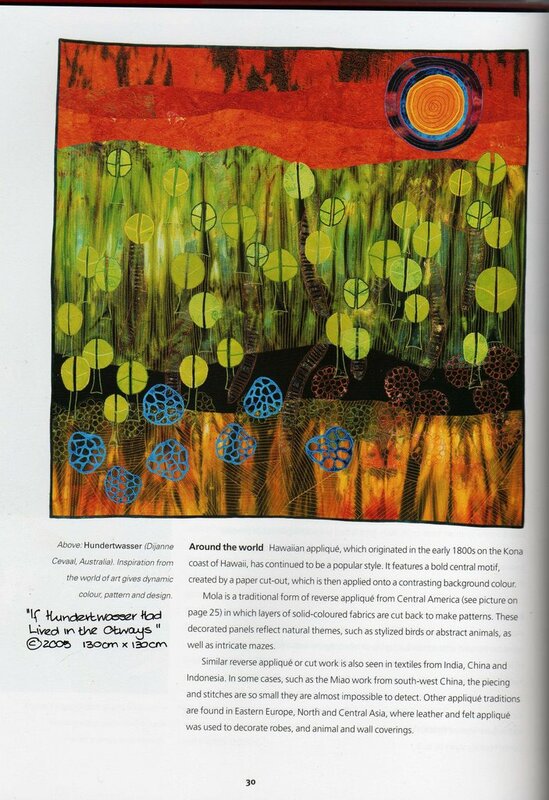 I was delighted that Sandra had asked me if she could include "If Hundertwasser Had Lived in the Otways" for the book and I am really happy with the colour production of it in the book.Sandra's blurb says it all. It is a great resource for those embarking on the art path, but there is plenty of ideas, inspirations and wonderful photographs for those further along the path . There are some good ideas for working up your thinking of your work and adding layers of depth/meaning to your researches. The signed book is available form Sandra's website. 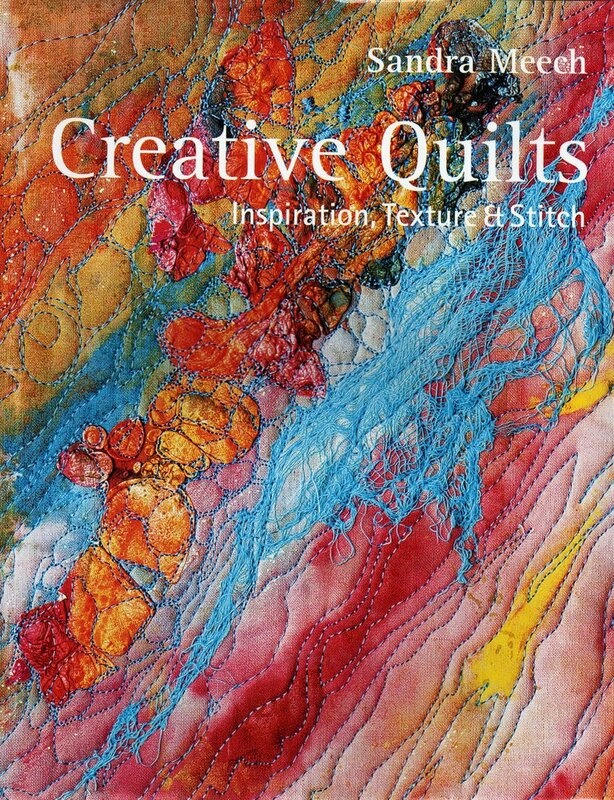 I also have Sandra's first book ( Contemporary Quilts:Design,Surface and Stitch) and I have to say hers are amongst the few quilt books I actually have- my library leans to textiles and the history of textiles and art. 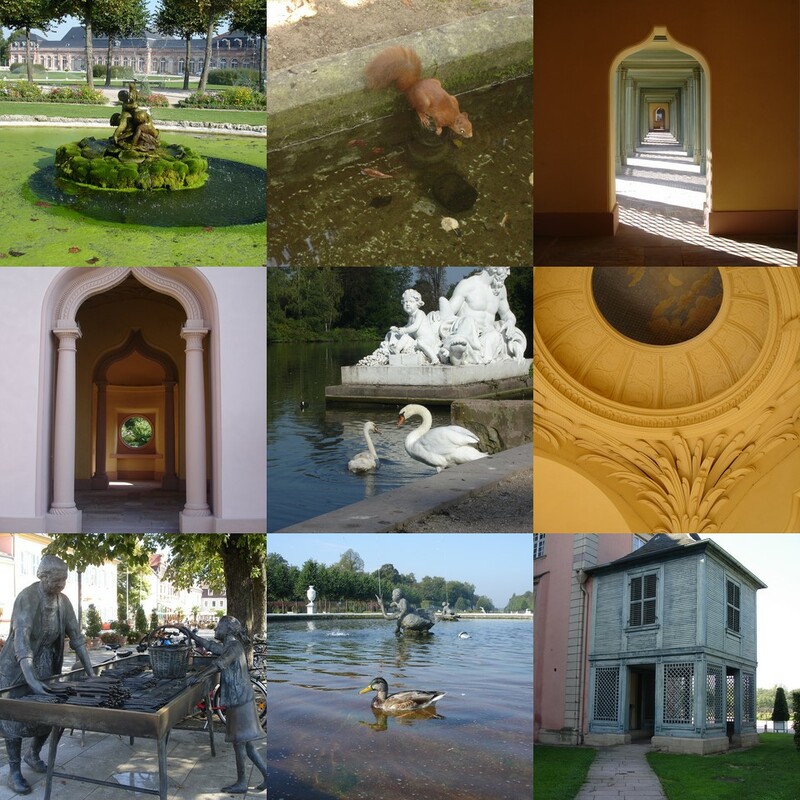 Schwetzingen was the summer palace of one of the Hannover Electors in the eighteenth century. As a palace goes it was rather modest but the grounds are wonderful and designed to elevate the mind replete with structures of classical design and a "arabian" garden and minaret. The wooden structure at the bottom right was the study of the elector, inspired by African huts again to inspire the mind.Ultimately however I enjoyed the way that animals had made each of these 'edifying' stuctures their own- a fine juxtaposition i thought. 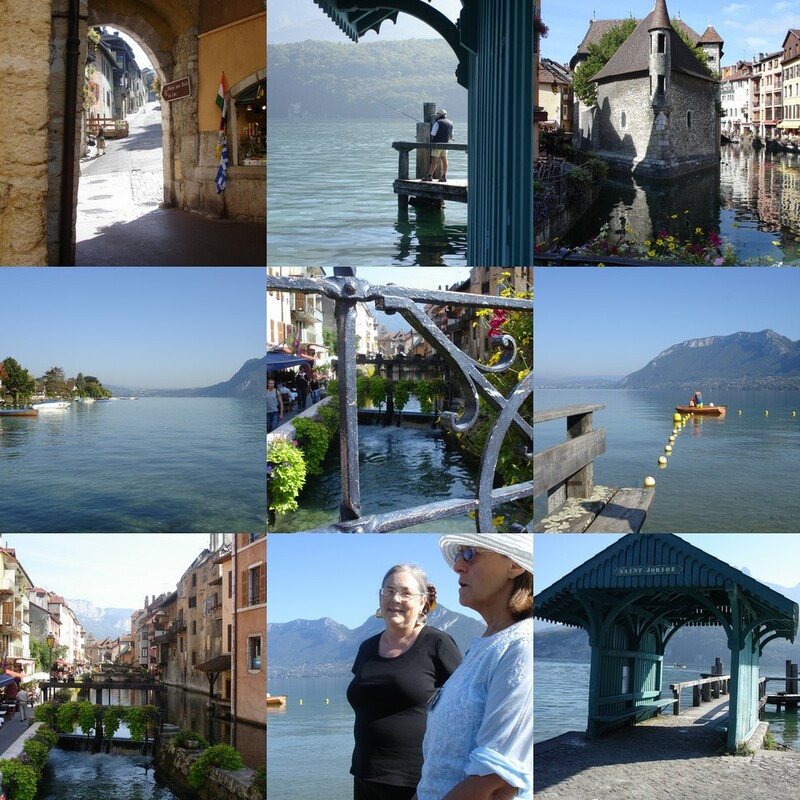 Annecy in the Haut Savoie in France is the home of Isabel Healy a member of the Alternative Quilt List run by Marion Barnett. Thelma Smith and I spent a delightful three days as Isabel's guest. The views around the lake were gorgeous and we were blessed with stunning weather. The town of Annecy itself is sometimes called the Venice of France and the old section of the town has canals. Ribeauville lies in the Vosges foothills and is a treat for the eyes with its brightly coloured Saxon houses and colourful flowered window boxes. 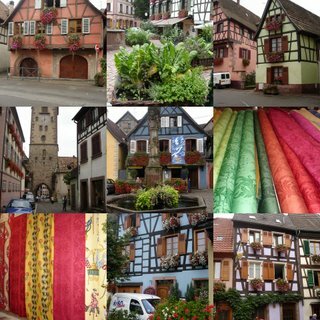 I particularly enjoyed the fountain square which had large baskets of vegetables and herbs rather than flowers as decoration- true to the gourmet traditions of the Alsace..Ribeauville itself was home to one of the first textile printing mills in Europe and there is a still functioning factory where fine fabrics using the old motifs are still produced. 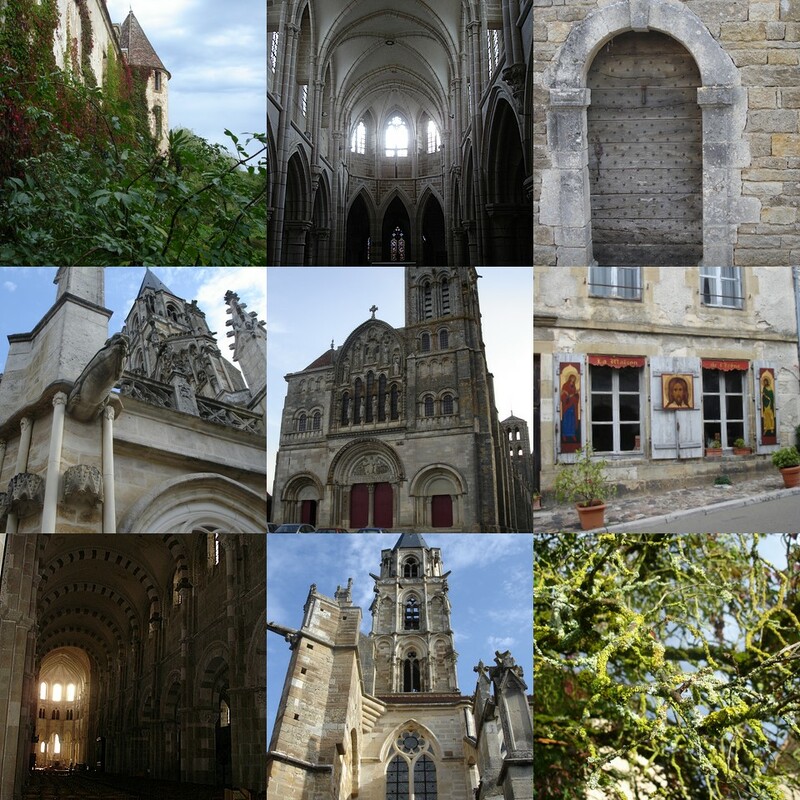 Vezelay and Chassy. Vezelay is one of the basilica's on the Pilgrims' route- the basilica stands atop a hill to which one must ascend ( though not as punishing as Rocamadour). The basilica crypt is said to have relics of Mary Magdalene and also said to lie on a leyline. 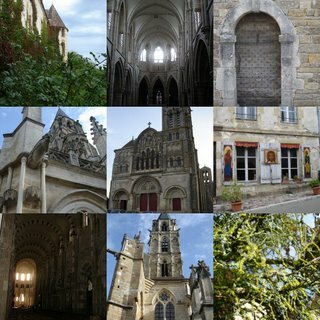 The more lacelike church is the gothic small basilica of St Pere a village two kilometers from Vezelay. I enjoyed attending the Carrefour Europeen du Patchwork and will be teaching there next year. There were some wonderful exhibitions and I bought some of the small Afghan embroideries which Pascale Goldenberg is selling in order to raise funds for Afghan women .The idea is that you use the embroideries to make a larger piece which will be exhibted in the future- so that in essence the work is a collaboration. Some new discoveries for me; Doerte Bachs curated exhibition called Time Patches- there were some wonderful pieces vailable and a catlogue in full colour with a page devoted to a detail shot and the opposite page with a full image is availabe through the website by contacting Doerte. Another was the work of Mariana Fruhauf ( sorry don't have the umlaut for the u in her surname)- I particularly liked the pieces that had holes cut out filled with rocks and other 'rocky'beads. I hope to get back to some work today or tomorrow- I have a lot to do before my next trip which will be to the Middle East in February. I have six hours to kill at Singapore Airport- so I thought I would post, so no pictures I am sorry. We have had a terrible week , Collin's father and my children's grandfather died on Thursday rather more suddenly than we had thought or hoped. 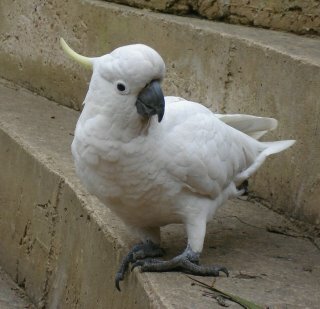 I was away teaching at Quilt Indulgence so my children were home alone, as Collin went to see his father the last time- a scenario I had desperately tried to avoid,but I couldn't get a flight out Thursday night and family lives about 4-5 hours from here we live.My children are desperately sad as he was a much loved poppy. The funeral is Thursday and unfortunately I have to keep travelling. I am sure I snored on the plane to Singapore , as we have all been a bit sleep deprived. 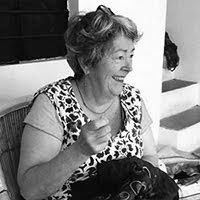 I am on my way to Carrefour de European Patchwork in Val d'Argent and will be helping out at Changing the World One Thread at a Time curated by Thelma Smith ( Link in my link column- I can't hyperlink on this computer sorry) Marion Barnett and Sandy Marcoux will also be there. Thelma has produced a cd catalogue of the work in the exhibition. I shall also have my Seventy Two Ways Not to Stipple or Meander available- after some much appreciated help from Kristin le Flamme( see Kristin's blog also in my links column) in organising printing in Germany. Thank you Kristin! Friday I went to Melbourne to deliver promised fabrics to Patchworks Unlimited in Pascoe Vale, and to buy some machine embroidery threads and to visit with friends where I stayed the night. We were sorting out photos for a catalogue for an exhibition which is travelling to Syria in 2007 and le Palisseau ( near Paris) for March/April 2007. 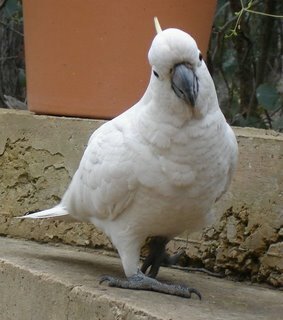 We got up early in the morning and went for a walk and then as we were sitting and chatting this sulphur crested cockatoo decided he needed to be part of the conversation- he came almost within touching distance.. I am still working on more pomegranate cards- have set myself a target of 100- whether I will get there is another matter as Tuesday I have to drive up to Quilt Indulgence, which is a 10 1/2 hour drive.I will be selling pomegranate cards after I come back from Europe- these ones I want to take with me.